19. Those who recite many scriptures but fail to practice their teachings are like a cowherd counting another’s cows. They do not share in the joys of the spiritual life. The Dhammapada is a collection of observations and advice in verse format, traditionally regarded as a concise summary of the Buddha’s teachings and most likely compiled by monks who needed the oral equivalent of a Buddhist handbook. The earliest known text version is part of the Khuddaka Nikaya of the Pali Canon, of which several English translations are currently available. Dhammapada verses are frequently quoted out of context as a means of endorsement or criticism, which is unfortunate. Take the above two quotes (1: 19 – 20), for example. A cursory reading might lead one to conclude that scripture study is less important than meditation, that all desires are unwholesome and all viewpoints are delusional. However, that would be a mistake. The “practice” being referred to here is none other than the Noble Eightfold Path of Right View, Right Intention, Right Speech, Right Action, Right Livelihood, Right Effort, Right Mindfulness, Right Concentration – “right” in this instance meaning whatever is wholesome and appropriate for the time and place and circumstances. 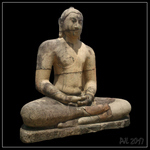 The Buddha’s eightfold practice is founded upon right view (i.e. conviction in the validity of Kamma and Rebirth, the Four Noble Truths, Dependent Origination, and the Three Marks of impermanence, suffering, nonself). The importance of right view is obvious when we consider how our beliefs (i.e. perceptions, ideas and opinions) shape our experience of life. Our beliefs might be well-formulated or half-baked. We might not fully understand our beliefs or even be aware that we have them. Nonetheless, our beliefs orientate us in the world. They underpin our choices and goals, and they inspire our efforts to seek happiness and avoid misery. Within Buddhism it’s axiomatic that we can hold our beliefs less tightly and exchange old dysfunctional/unwholesome beliefs (e.g. about self) for new ones that are more functional/wholesome within the ever-changing world we’re currently experiencing. Within Buddhism dhamma study and discussion has long been regarded as essential for developing right view. In the Buddha’s time, the dhamma would have been recited by someone well versed in theory and practice. Nowadays we’re more likely to read the dhamma or listen to recordings, and if we’re living in a country where Buddhism isn’t widely practiced we may be unable to receive direct instruction from a personal teacher. Unfortunately, studying and meditating alone is unlikely to overcome the mind’s natural habit of bias confirmation. If we’re to avoid developing a distorted viewpoint we need to stop cherry picking the dhamma and we need to check our learning through discussion with fellow travellers on The Path. We can say that we have right view when our understanding of Buddhadhamma results in a sincere wish never to be reborn again. Only with conviction in the “rightness” of Buddhadhamma will we resolve to cultivate wholesomeness and renounce unwholesomeness for the sake of ultimate liberation. Inspired by right view, our intention to rightly practice renunciation, good will, and harmlessness, will motivate our constant application of right effort, right mindfulness and right concentration to all verbal, bodily and mental actions in every changing circumstance. We’ll study and practice all eight aspects of The Path simultaneously so that we may live wholesomely in alignment with the impermanence, the suffering, and the nonself characteristics of our life experience. We’ll frequently recollect and meditate on the dhamma we’ve learned – again and again – until we stop the existential clinging that keeps us forever discontented. “Yamakavagga: Pairs” (Dhp I), translated from the Pali by Acharya Buddharakkhita. Access to Insight (BCBS Edition), 30 November 2013. “The Noble Eightfold Path: The Way to the End of Suffering”, by Bhikkhu Bodhi. Access to Insight (BCBS Edition), 30 November 2013. This entry was posted in Commentary, Sutta and tagged buddha, dhammapada, quote, sutta, teachings. Bookmark the permalink. The eight factors of The Path are traditionally grouped under three broad categories of training. The Trainings in MORALITY or SILA incorporate the spokes of right speech, right action, right livelihood; to be developed by practicing a minimum of five precepts (refraining from killing, stealing, sexual abuse, falsehood, and intoxication). The Trainings in CONCENTRATION or SAMADHI incorporate the spokes of right effort, right mindfulness, right concentration; to be developed by establishing the mind in jhana, usually by applying the mental qualities of samatha and vipassana to a single sensation or preoccupation. 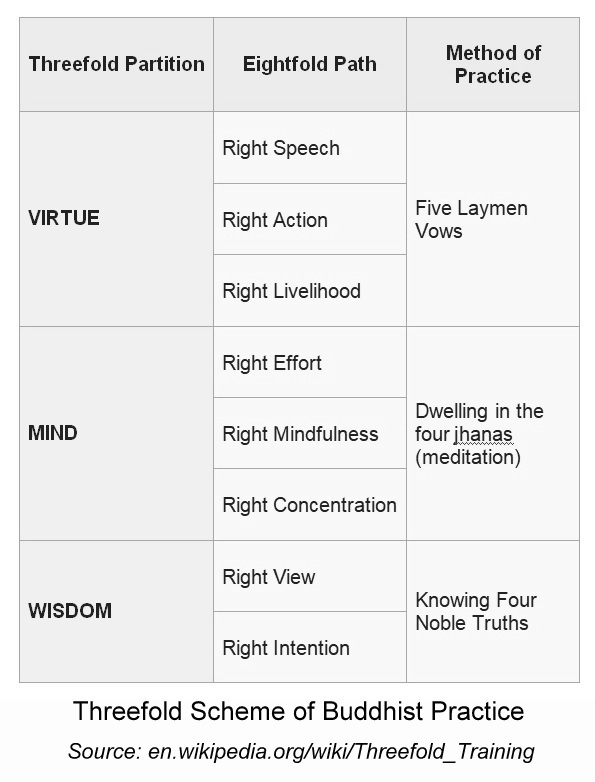 The Trainings in WISDOM or PANNA incorporate the spokes of right view and right intention; to be developed by rightly understanding the Four Noble Truths. The point of the twin verses Dhammapada 1: 19 – 20 is to warn us against complacency and hypocrisy. Sure, quoting scriptures without any practical knowledge is rightly criticised. A little scripture well understood and well practiced will serve us far better than a lot of scripture poorly understood and little practiced, and you’ll notice that the combination of a little scripture well practiced is exactly what the Buddha is praising. However, the intention to practice Buddhadhamma rightly in accordance with the Four Noble Truths sutta (i.e. right intention ) depends initially upon having a foundational theoretical right view that will eventually mature into a transcendental experiential right view that puts an end to samsara when the threefold trainings have been properly developed.